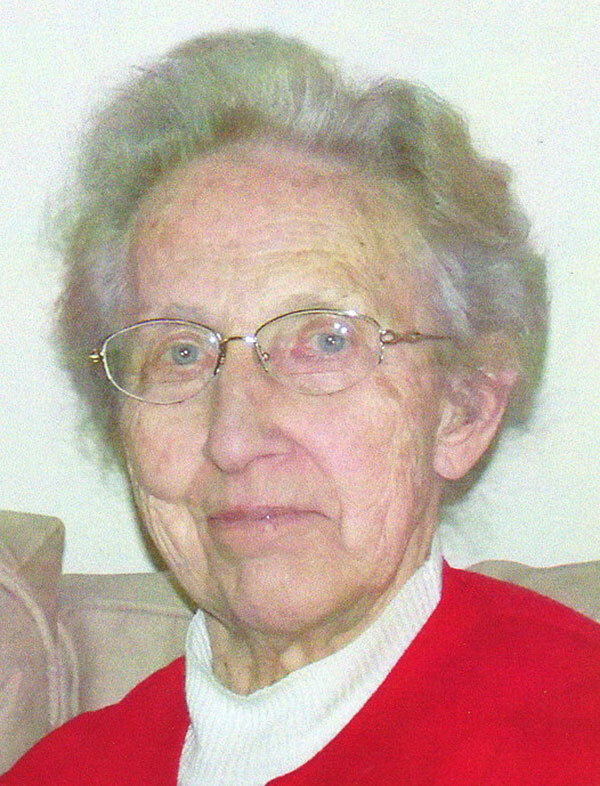 Ella Mae (Mosher) Knoch, 89, of Cedar Springs, went to be with her Lord on Wednesday, August 3, 2016 at Vista Springs. Ella Mae was born October 29, 1926 in Cadillac, Michigan the daughter of Clifford and Lavona (Stark) Joslin. She was a longtime member of Pilgrim Bible Church and had served as secretary and treasurer. She enjoyed sewing and taught a sewing class at Pilgrim Bible Academy. She had been active working the voting booths for Ensley Township. She loved the Lord, her church and her family. Surviving are her husband, Walter Knoch Sr. whom she married on December 12, 2010; son, Rodney (Sue) Mosher; seven stepchildren; grandsons, Kenneth (Stephanie) Mosher, Peter (Grace) Mosher; great grandchildren, Greyson, Hazelle, Kiptyn, Hunter, Bosten and a granddaughter on the way; many step grandchildren and great grandchildren; brothers, Harry (Sarah) Joslin, Elwyn (Goldie) Joslin; sister, Orpha Nicholson; many nieces and nephews. She was preceded in death by a husband, Maynard Mosher; daughter and son-in-law, Connie (Richard) Tiede; great-granddaughter, Emery Mosher; brother, Leon Joslin; sister, Olive Hurst. The family will greet friends Sunday from 2-4 and 6-8 pm at the Bliss-Witters & Pike Funeral Home, Cedar Springs. The service will be held Monday 11:00 am at Pilgrim Bible Church, Cedar Springs. Pastor Michael Shiery officiating. Interment Crandall Cemetery, Ensley Township. Memorial contributions may be made the Alzheimers Association or Pilgrim Bible Church. A Cedar Springs man who pled guilty to an assault last summer has now been charged with two counts of criminal sexual conduct and other charges. According to Cedar Springs Police Chief Roger Parent and 63rd District Court, Austin Lee Mosher, 20, has been charged with one count of Criminal Sexual Conduct 3rd degree (incapacitated victim) and one count of CSC 4th degree (incapacitated victim), both felonies. He was given a $10,000 10 percent bond on the charges and remains in custody. He also has a separate charge of possession of drug paraphernalia (through the Kent County Sheriffs Department), and three separate cases of probation violation. The probation violations are related to the assault case last spring, when he wandered up a stranger’s driveway in a drunken state, threatened to kill the man who lived there, and head butted and punched a dinner guest of the family, fracturing the man’s nose. Mosher pled guilty to aggravated assault, but two other counts—resisting/obstructing police and disorderly conduct/public drunkenness—were dismissed as part of the plea deal. He was sentenced to a 335 days in jail, which was suspended, as long as he served 30 days on a tether and abided by the terms of his probation. One of the violations involves not completing his tether, and the others have to do with not completing counseling and restitution. Mosher will have a preliminary hearing on all the charges on March 21 at 2:45 p.m.
An Algoma Township man arrested for head-butting a stranger and fracturing his nose last summer pled no contest to aggravated assault as part of a plea agreement Monday. Austin Lee Mosher, 19, was originally charged with aggravated assault, resisting/obstructing a police officer and disorderly conduct/public drunkenness for his behavior on July 23. The suspect had been visiting a friend in Northland Estates, off Northland Drive, when he wandered across the street into a neighbor’s yard, visibly intoxicated, and threatened to kill the man living at the home if he didn’t stand still and talk to him. He then head-butted and punched a Grand Rapids man, who was a dinner guest of the family and just leaving the home. The family had never met the suspect before. The man wandered away, and the family called police. Officers arrived to find the incoherent subject sitting in a vehicle that was not his. Police said the suspect did not comply with verbal commands, and one officer was ready with a TASER, while others ordered the 19-year-old man to the ground. The suspect again became aggressive, fighting and kicking at officers. An ambulance was called to transport the suspect to an area hospital due to his unknown condition and combative behavior. Under the plea agreement, Mosher pled no contest to the aggravated assault charge, and the other two counts—resisting/obstructing a police officer and disorderly conduct/public drunkness—were dismissed. He was sentenced to 335 days in jail, which was suspended, as long as he serves 30 days on a tether and abides by the terms of his probation. He also must pay $100 in restitution, $855 in state and court costs, and $250 in attorney fees. An Algoma Township man arrested for head-butting another man and fracturing his nose last month has pled not guilty to that charge and two others. Austin Lee Mosher, 19, entered the plea in Kent County’s 63rd District Wednesday during his arraignment on charges of aggravated assault, resisting/obstructing a police officer and disorderly conduct/public drunkenness. Cedar Springs Police responded to a disorderly subject call about 10 p.m. Saturday, July 23, on Beckett Blvd in Northland Estates Mobile Home Park. While enroute, they received additional calls that this person had assaulted a citizen who was outside in their driveway. Officers arrived to find an incoherent subject sitting in a vehicle that was not his. Police said the suspect did not comply with verbal commands, and one officer was ready with a TASER, while others ordered the 19-year-old man to the ground. The suspect again became aggressive, fighting and kicking at officers. An ambulance was called to transport the suspect to an area hospital due to his unknown condition and combative behavior. Investigating officers learned that the suspect had injured a 26-year-old Grand Rapids man, after he head-butted him in the nose. According to witnesses, the suspect wandered into the yard, and threatened to kill the man living at the home if he didn’t stand still and talk to him, and then head-butted and punched the Grand Rapids man, who was a dinner guest of the family and just leaving the home. The family had never met the suspect before. The court set a date of August 30 at 10 a.m. for a pretrial hearing. A cash/surety bond of $2,500 was continued, and the suspect was ordered to have no contact with the victim.